You should have a personal Facebook account. You should be able to provide full details for the payout account which Facebook will pay to. 2. 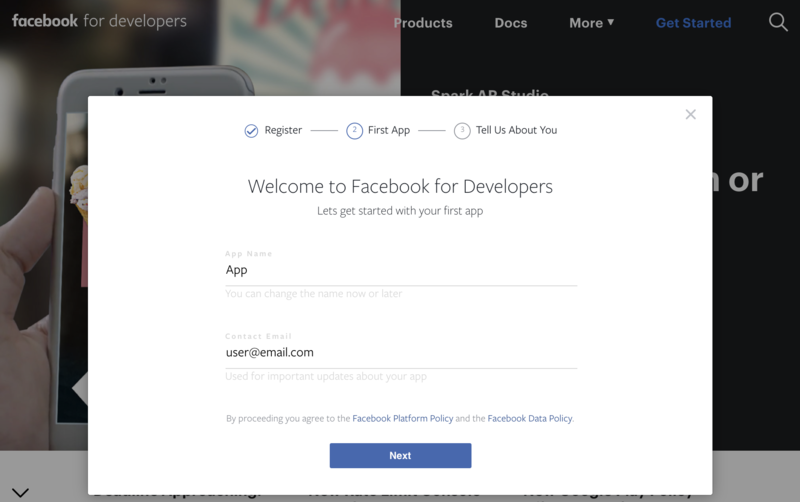 Accept the terms and add your first app. 2. Go to app's dashboard and add the Audience Network in Product settings by pressing "Set Up" in the corresponding block. IMPORTANT. 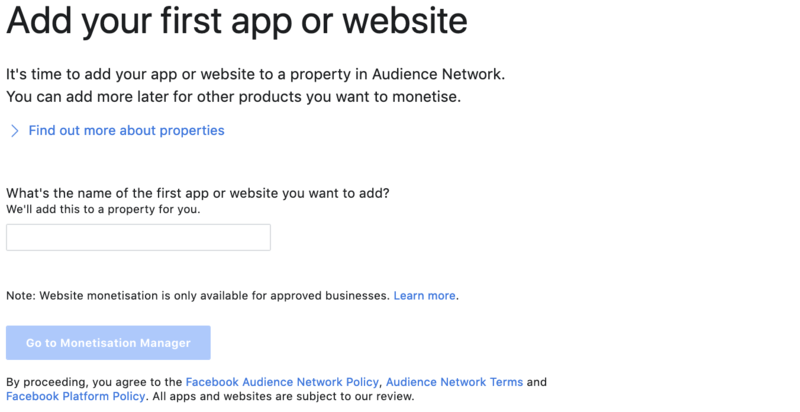 If Audience Network is already added as a product, you should set it up according to this FAQ guide. 3. Create a new business or choose an existing one. 4. Create a Property and name it. Your Property is composed of any apps you add to it. Click "Go to Monetization Manager". If your product has multiple versions based on operating systems or devices, you can group these versions together into a property for combined reporting and management. Each property can contain one iOS app, one Android app, one website domain, one Instant Articles Page and one Instant Game." 5. Add an iOS or Android app to your Property. 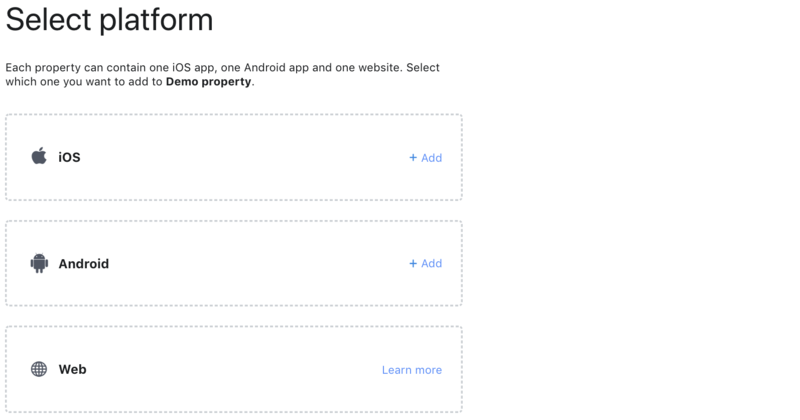 All apps are added to a Property in Monetization Manager. Within a Property you can have up to 4 Ad Spaces per platform where you can add ad placements. 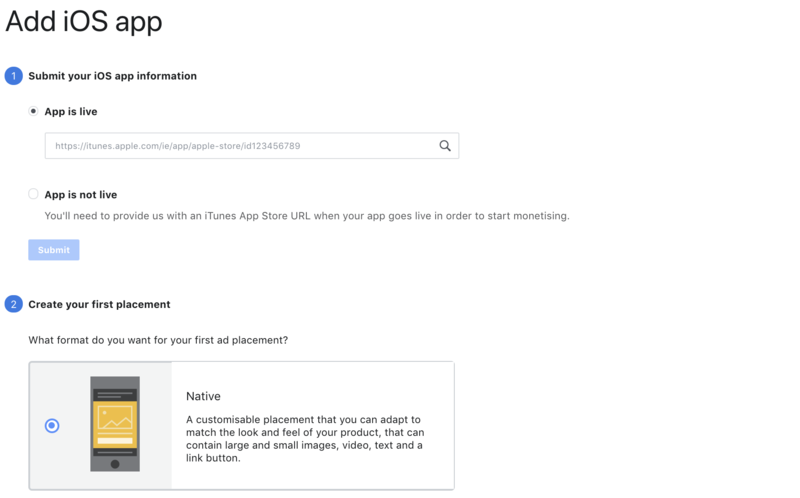 Give your Ad Space an easily identifiable name, such as 'Notifications' for ad placements that are shown on the notifications screen, or 'Launch' for ads that are shown when your app launches. 7. 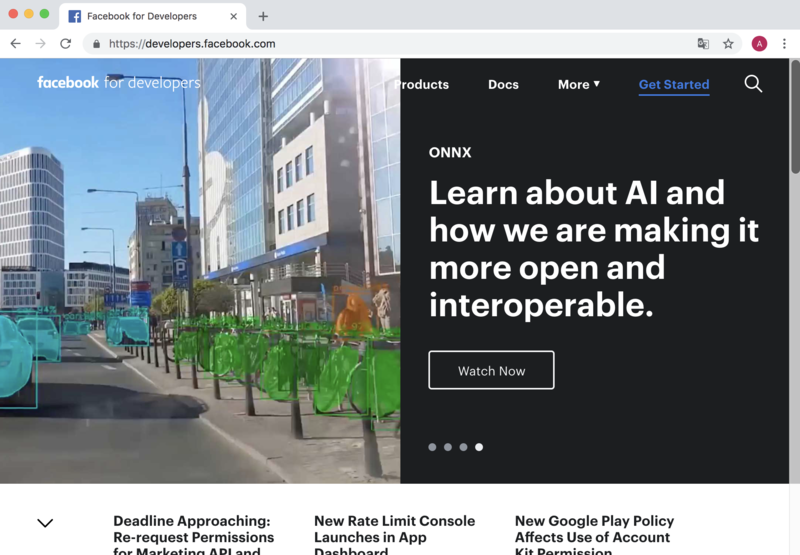 Add a video and description of when and where your ads will be triggered. It's best to be as detailed as possible, as this information will be used to find and review the ad experiences in your app. Even though the video is optional, it is recommended to add it to help the review team approve your app faster. Click "Create placement". 8. Go to Monetization Manager. Click Manage next to the property where you'd like to create a placement. 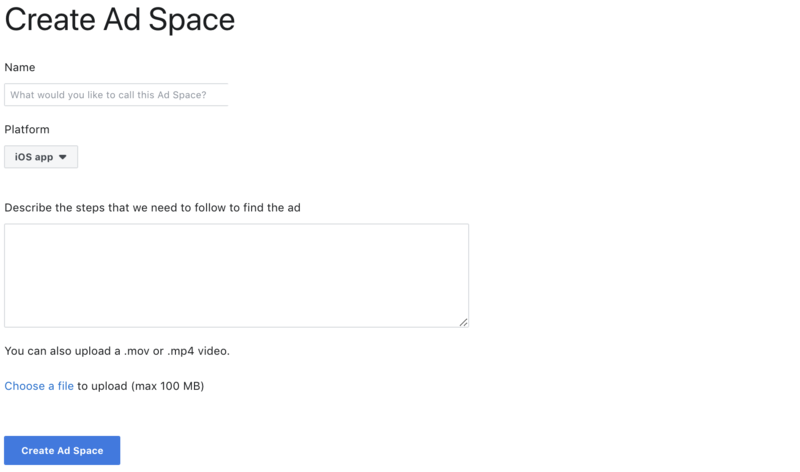 Create a new Ad Space or click Manage on an existing Ad Space. 9. Click Create placement. Name your placements and select Ad Type below Display format. Note: If you plan using large images or videos in your native ad layout, please choose Native placement. 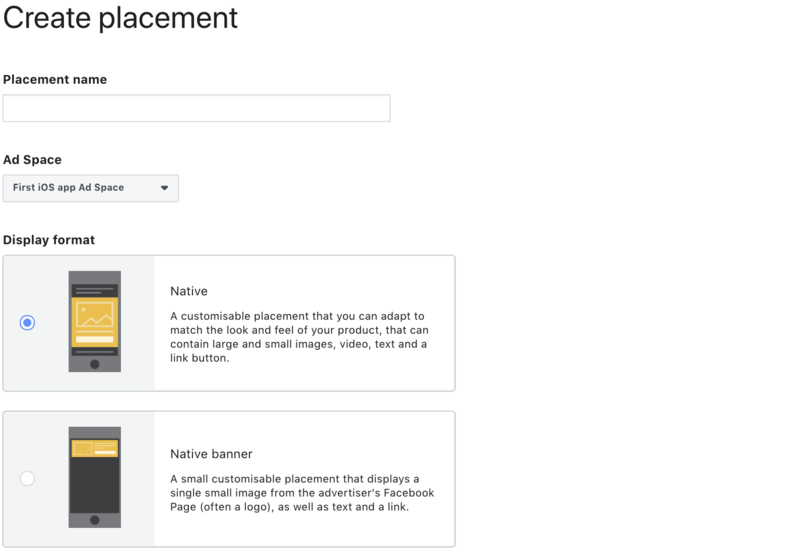 If your visuals are of smaller sizes, create Native banner placement instead. 1 placement "Accept any price" — for all ad types. Mandatory to use. 1 placement "Don't accept low prices" → "Upper floor" — for all ad types. 1 placement "Don't accept low prices” → "Lowest floor" — for all ad types. 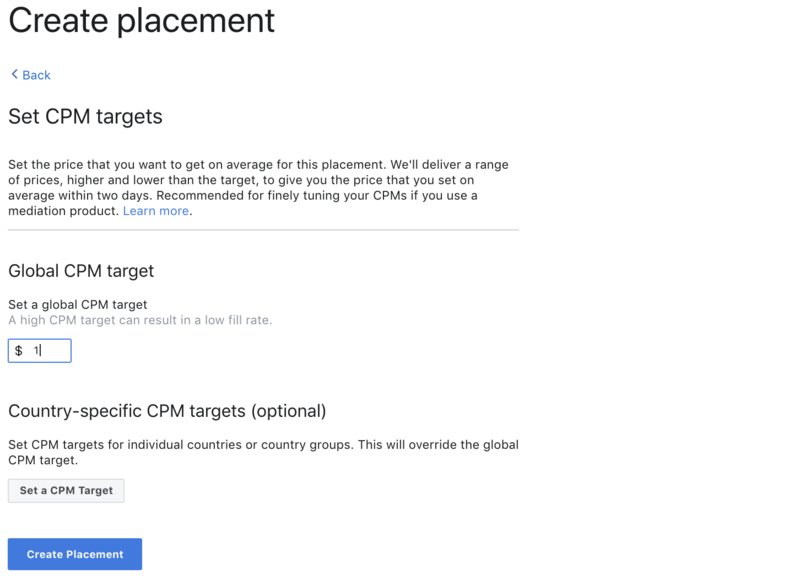 3 placements "Set CPM target for your price" — for all ad types. Use different prices for each ad type. Rewarded video: $10.0, $15.0, $20.0. 11. Set up CPM targets for every placement as listed above and click "Create Placement". Choose an app for linking. 4. Choose placements type — Monetization manager. 6. IMPORTANT. Make sure App ID and placements' ID prefix are the same (for example, App ID 1479196438880299 and placement ID 1479196438880299_1485436281589648). Otherwise recreate your property properly according to this link. 7. Fill in all fields and click "Save". Enter your payout info. You won't be able to receive Audience Network ads until your payout details have been added. You can add your payout info as soon as your account in Business Manager and Property is set up. Learn more about adding or editing payout information. 2. Click Send for Review to review your details. Keep in mind: You'll need to make your updated app live on the Google PlayStore or App Store to be able to send it for review. 3. Once you've reviewed your details, click Send for Review again to submit your app for review. At the end of this step, you should have Audience Network ads showing in at least one placement within your app. You can now start creating more Ad Spaces and ad placements where you'd like to show ads within your app. For Facebook to validate the ad request you send, use the latest version of Appodeal SDK. Test the integration using real ads on a real device while logged into your account in Business Manager using your Facebook account. Test ads won't allow you to submit your app for review. Put Audience Network at the top of the waterfall to make sure that Appodeal sends requests to Audience Network. Learn more about overriden waterfall here. You can remove a segment after sending ad requests. If you can't see your account in Business Manager in the list, you may need to contact the account's business admin to be able to use Audience Network with that account. Alternatively, you can create a new account in Business Manager to get started. If your account in Business Manager already has properties set up, you'll go straight to your account in Monetization Manager. If you want to add a new app for a different brand, create a new Property. Each Property can only contain up to one iOS app, one Android app, one website domain and one Instant Articles platform. Make sure you log in with your real Facebook account and don't use a fake account or a duplicate account that you created for work purposes. Make sure to check these troubleshooting tips to get started with the Audience Network.